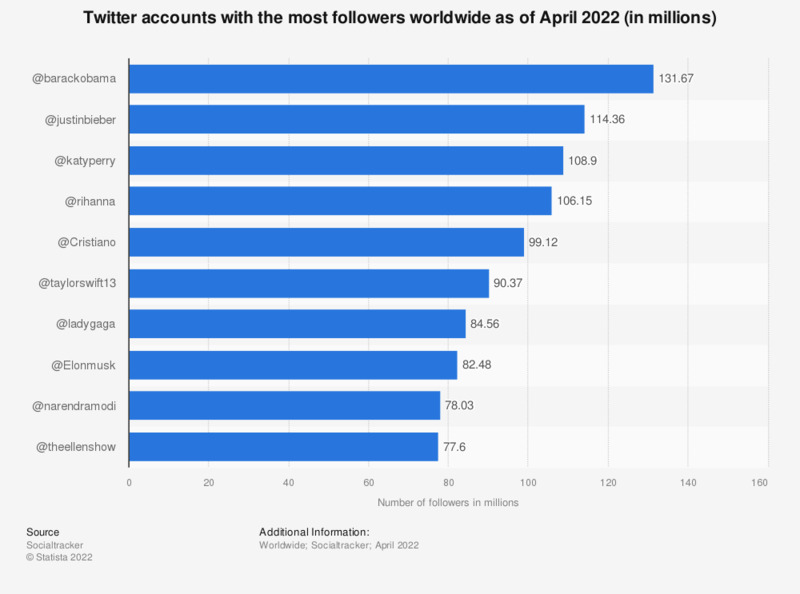 This statistic presents a ranking of the most popular Twitter accounts as of February 2019, sorted by the highest numbers of followers. During that month, singer Katy Perry's account @katyperry had 106.9 million followers. In comparison, former U.S. President Barack Obama's account was followed by 104.7 million people. Founded in 2006, Twitter is an online social networking and microblogging service that allows users to post text-based status updates and messages of up to 280 characters in length. These messages are known as tweets. As of the fourth quarter of 2018, Twitter had more 321 million monthly active users. Twitter provides a near-instant access channel to celebrities. The majority of the top ten most-followed Twitter accounts are entertainers who use the medium to communicate with fans, spread relevant news regarding their work or work on their public image. The near-instant gratification through a stream of direct updates from celebrities or personalities as well as the feeling of belonging to a particular group of fans is a popular reason for social media users to use Twitter. In order to establish authenticity of identity on Twitter, accounts of people from high-interest areas such as music, fashion, entertainment, politics, media, business or other areas as well as individuals at high risk of impersonation are verified by Twitter. The verification badge symbolizes that the account is maintained by a legitimate source. Major sporting events and industry award shows such as the Super Bowl, the Grammy Awards or Academy Awards generate lots of online buzz on Twitter. The online discussion allows users to participate in the success of celebrities who often post behind-the-scenes photo tweets or commentaries. On-set or in-concert tweets are further methods of celebrities enhancing their appeal, and level of fan interaction.